Made in St Kilda, by Brendan McKenzie, Pieter Malherbe and yours truly Luke Simmons, bytestories is a new storytelling site which can provide you with your “sit-down-at-the-keyboard comedy” fix on demand. 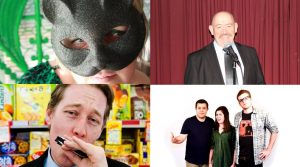 Dedicated to short, byte-sized stories (There is a 1500 character / 200-250 word limit) based on true events, it’s proving to be a popular writing space for some of Australia’s favourite and up-and-coming comedians. MICF 2013 comics who have shared that time when…. Brad Oakes and Michael Connell have already revealed some of their most embarrassing stories, Alexis Simmonds has exposed why her Uncle deviously volunteered to learn craft while at school and Becky Lewis takes you through what it’s like to work in a bar full of hard drinkin’ cowboys. Other recommended authors on the site include: Andy Thompson, Nick O’Connell, Jennifer Burke, Tom Middlebrook, Ron Hailes, and Torre De Roche. If you’re thinking about sharing a story, it would suit if you do not wish to have the hassle of setting up a blog OR if you’d like your funniness to reach an International audience. It could also be a good way for performers to work on ideas for a routine or festival show. The site is cute and ideal for killing time while at home or on your mobile (i.e. sitting/staring on public transport). The reader in you can get on-demand chuckles and the comedic writer in you will enjoy gathering a fan base. Check out www.bytestories.com and get involved! Next Next post: Interview with Josh Earl and Ged Wood about Clued UP!